This catalog page features items and products made in the United States of America. All Angelina fibers and film are manufactured and packaged in the U.S.A. 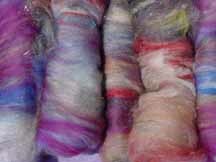 Here you will find finished items I have made and my handspun yarns. I hand make each and every batt on my Ranch, no two are exactly alike but will have the same fibers and colors. Yes, I'm an American and my ancestors fought for our freedom in the Revolutionary War, and I belong to the Daughters of the American Revolution. I believe in the United States and beileve in buying and supporting our country. Yes, I drive a Ford Pick up truck! Nancy Campbell is an avid knitter, and designer of many award winning creations. Nancy lives in the foothills of the Sierra Nevadas where gold was first discovered in California. This wonderful book of quilting patterns was created by Dena Twite Please check her book out. Dena lives in Cottage Grove, Oregon. An.